Both dresses and the bracelets are located in Porsche's Boutique. 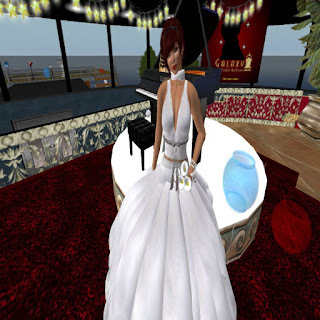 Suzzete, the white gown could be used for a wedding gown or formal dance. By contrast, the Sassy Brown and White cocktail dress is sure to put sparkle in someones eyes. The bracelets are called Silver Hoops, these would be perfect for most ensembles.